This Week is National Estate Planning Awareness Week | The Levin Law Firm - Philip Levin, Esq. 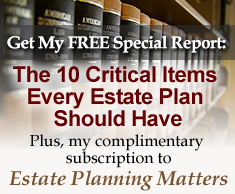 Estate planning is a vital component of every financial plan, regardless of the size of your client’s estate. Unfortunately, this area of planning is often overlooked, resulting in emotional hardship and significant financial loss to families when a client suffers an illness, injury, incapacity, or passes away. By engaging competent counsel to design and implement an effective estate plan, your clients can enjoy peace of mind by making sure that their property distributes to their beneficiaries, in the right manner and at the right time. It is estimated that over 120 million Americans do not have up-to-date estate plans and long term financial strategies to protect themselves or their families in the event of an illness, incapacity, or untimely death. The purpose of National Estate Planning Awareness Week is to encourage citizens to address these vital issues, before a life event occurs that might adversely impact their daily lives, resulting in the inability to establish or revise their estate plan. For the many millions of Americans who do not have an up-to-date life and estate plan, including a Will, Financial and Health-Care Powers of Attorney, Advance Medical Directive, and Financial Plan, the consequences can prove devastating in the absence of a cohesive plan. Knowledge of what steps to take, and implementing a well designed estate plan, prevents delays, unnecessary expenses, and confusion which results when crisis planning is required. Wills, Trusts, and other important estate planning legal documents should only be prepared by a knowledgeable and experienced estate planning attorney. To arrange an “Estate Planning Check-up” with your selected clients, contact Sherri at The Levin Law Firm to schedule a Complimentary Consultation at 610-977-2443.